On 22 June 1941, the German Army Group South invaded Ukraine as part of a massive surprise attack against the Soviet Union. The Southwest Front of the Red Army of Workers and Peasants struck back, resulting in World War II’s largest tank battle. Fire in the Steppe is a complete Panzer Grenadier game based on the early battles of Operation Barbarossa in Ukraine: the huge tank battles around Brody and Dubno. There are 42 scenarios based on these battles, organized into “battle games” that allow you to play the scenarios in sequence toward your army’s operational goals. Plus a solitaire campaign game! 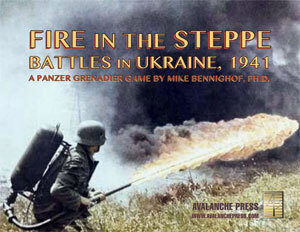 Fire in the Steppe includes 562 playing pieces, most of which originally appeared in our old out-of-print Eastern Front game. There are eight heavy cardstock maps: new versions of those which appeared in Eastern Front, with completely new artwork by Guy Riessen so they match up nicely with those from games like Broken Axis and Burning Tigers. The Royal Romanian Army invades the Soviet Union in Summer 1941. A book supplement for Fire in the East (and only Fire in the East) with 98 die-cut pieces and 20 scenarios.